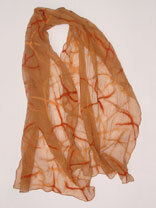 This scarf was made by laying out thin lengths of roving in random overlapping whispy "X" shapes on a gauze scarf. The scarf was felted by the traditional rolling method and fulled by hand rubbing while flat on the rolling mat. Finished size: ~ 16 1/2" x 58"